*Quick – what NEW YORK radio host held the Guinness world record for longest-running show with a single host? That was WNYC’s Oscar Brand, whose 70-plus years as host of “Folksong Festival” came to an end on Friday with his death at age 96. The folksinger’s career on radio started on a whim with a 1945 letter to the city-owned station offering to present a program of obscure Christmas songs. 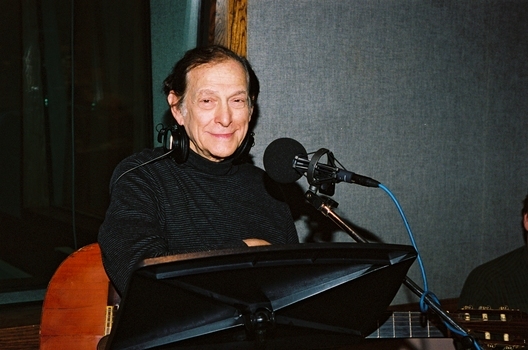 That one-off show turned into a fixture on WNYC’s schedule that survived, well, everything: Brand stayed on the station through the blacklists of the 1950s (he was listed in the infamous “Red Channels”), through its transition to an NPR outlet in the 1970s, through its move out of city ownership in the 1990s, right up until what turned out to be his final show Sept. 24. Over all those years, Brand never had a contract with WNYC and never received a penny from the station for doing his show, which had most recently been relegated to a 10 PM Saturday slot on WNYC’s AM 820 signal. And over all those years, Brand had everyone on his show, from a young Bob Dylan to a blacklisted Pete Seeger to Woody Guthrie and his son, Arlo, to the Weavers to…well, everyone in the folk community. All along, Brand carried on a prolific career as a writer and performer, receiving a Peabody Award in 1995 for his contributions. In an autumn when we’re losing icons all over the place, including the retirements of Charles Osgood and Vin Scully, Brand’s death marks yet another end of an era, the last link between today’s big-budget WNYC and its early shoestring days when any New Yorker could get a shot at airtime just for writing a persuasive letter. We’ll not see his like again. This was the show we’ll long remember as the end of the Dickey era at Cumulus, with the news of Lew and John Dickey’s ouster from that troubled radio company landing with a thud just hours before the show’s opening. It was the show that raised still more questions (but offered few answers) about the battle between Nielsen and Voltair. 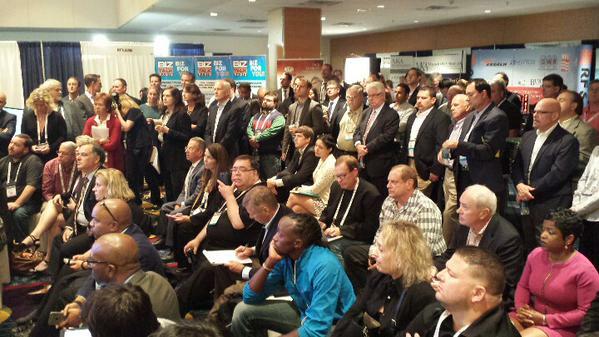 (All those folks in the photo at right were waiting for Nielsen to make its PPM presentation – “standing room only” didn’t even begin to describe it.) For AM owners waiting for some help from the FCC, it was the “keep waiting a little longer” show. And with attendance on an upward swing – the 2,170 radio people who attended made for a head count up 5% from last year’s show in Indianapolis – it was perhaps even an optimistic show. *One of the most prominent local TV anchors in CANADA has died. Max Keeping was a Newfoundlander who started in TV in 1963 at CJCH-TV in Halifax, but he made his home and his legend in Ottawa, where he arrived in 1965 to work at CFRA (580). Keeping joined CTV as a parliamentary reporter in 1965, made a failed run for Parliament himself in 1972, then joined CJOH-TV (Channel 13) later that same year. Keeping spent the rest of his career at CJOH, becoming the star anchor of its 6 PM newscast and a tireless community advocate who raised hundreds of millions of dollars for the Children’s Hospital of Eastern Ontario and other charities. Keeping retired from CJOH in 2010 and had spent the last few years dealing with several health problems, including two bouts with colorectal cancer and a brain tumor discovered in May that left him without the ability to speak in the last few months of his life. Keeping was 73 when he died on Thursday. *The creditors holding the debt for NEW JERSEY‘s Nassau Broadcasting Partners are moving quickly on their attempt to force the company into Chapter 7 bankruptcy and liquidation: they’ve persuaded Judge Kevin Goss of the U.S. Bankruptcy Court in Delaware to move up a hearing on the petition to this Thursday morning at 10, claiming “there is a genuine concern that assets of the alleged debtor’s estates may be used for purposes other than those directly related to the normal course operations of the alleged debtor’s businesses.” The petition from the lenders, led by Goldman Sachs, says they’re worried that Nassau money may be used “to further the personal and parochial interests of” Lou Mercatanti, who’s run the company since 1986. *There’s a TV station sale in PENNSYLVANIA: WTVE (Channel 51) is licensed to Reading but serves most of the Philadelphia market through the use of a “distributed transmission system” that employs multiple RF channel 25 transmitters scattered across the region. Richard French, who owns WRNN in the New York market, paid $13.5 million for the station at a bankruptcy sale in 2008. He’ll get $30.4 million from NRJ TV for the signal, and it’s not at all clear yet what NRJ plans to do with WTVE. *In Philadelphia, there’s a new owner at WHAT (1340), which recently returned to the air with a Spanish-language hits format as “El Zol 1340, el ritmo de Philly.” Aztec Capital Partners has been programming that format, and now it’s buying the station from former owner Marconi Broadcasting Company. Marconi paid $5 million for the 1000-watt signal five years ago, but Aztec’s paying only a fraction of that: just $475,000. *It’s been a week of big radio changes in CANADA, starting with the demise of the last high-power CBC station on the AM dial between Newfoundland and Manitoba. With its new FM outlets, CBEW (97.5 Windsor) and CBEW-1 (91.9 Leamington), now on the air and some interference issues with cross-border signals resolved, the CBC shut down CBE (1550 Windsor) early on the morning of October 1, the sixty-first anniversary of CBE’s sign-on in 1950. The sign-off itself happened without fanfare; indeed, the scheduled midnight end to CBE was stretched out for a bit as the station popped back on and off the air several times before finally dropping audio at 12:25, leaving just a dead carrier on 1550 instead of the “tune to FM” audio loop that has accompanied other CBC AM-to-FM moves in the past. *While CBE’s passing into history, a Toronto broadcaster is poised to make history with a new station launch today. Fitzroy Gordon’s CKFG (98.7) will make its official debut later this morning, with an 11 AM news conference scheduled to announce the station’s on-air identity. Gordon fought for years to establish a station owned by and serving Toronto’s Afro-Caribbean community, operating his “CARN” on 98.7 for several successful test runs and overcoming objections from the CBC about potential interference to its CBLA (99.1) signal in order to win a license from the CRTC. There’s a new broadcaster coming to the TV dials in MASSACHUSETTS and CONNECTICUT. Arthur Liu, whose Multicultural Radio Broadcasting has become a major force in leased-time radio in big cities from Boston to New York to Los Angeles, is entering the television arena with the $170 million purchase of Shop at Home TV’s five UHF stations from Scripps Howard. Liu is creating a new company, Multicultural Television Broadcasting, to operate the stations. Four of the five, including WMFP (Channel 62) in Lawrence, Mass. and WSAH (Channel 43) in Bridgeport, Conn., were full-time outlets of the former Shop at Home TV network, which Scripps also recently sold. Since that sale, they’ve continued to broadcast the network under its new owner, Jewelry Television. That will surely change under Multicultural, whose model for TV will likely follow the company’s successful radio model, under which all or nearly all of its stations’ airtime is leased out to program producers, mostly in foreign languages or serving ethnic audiences. For WMFP, which transmits from One Beacon Street in Boston and has nearly full-market cable carriage, that shouldn’t be difficult. For WSAH, it will be a bit more of a challenge – while the station is technically in the New York City TV market, it has little cable carriage beyond Connecticut and no over-the-air presence in the city itself. Given its distance from the center of the market, and its history of non-carriage on New York and New Jersey cable systems, it may face a challenge in getting on cable in those areas, which would impair its reach. In other news from the Bay State, Jay Severin returned to his former radio home Monday, as the cancellation of his Westwood One syndicated evening offering freed him to return to the 3-6 PM slot on flagship WTKK (96.9 Boston). The move once again puts Severin head-to-head against Howie Carr on WRKO (680), and it pushes Michael Graham from WTKK’s afternoon drive slot to evenings. Severin also says he’s moving from Sag Harbor, N.Y. (where he’s been doing the show via ISDN since its Boston-only days at WTKK) up to the Boston area soon. It’s not often that we start a NERW report in NEW JERSEY, but this week, that’s where the big story seems to be. To be precise, it’s in Bridgeton, way down at the southern end of the Garden State, where aficionados of quirky local radio have long prized WSNJ (107.7/1240) as an exemplary specimen of the kind of full-service station that disappeared most places years ago. Under the ownership of Ed Bold, WSNJ today sounds pretty much the same way it did a couple of decades ago – everything from lost-dog announcements to school menus, with a few songs here and there, a top-hour ID that still proudly proclaims that the FM signal is “in stereo,” and a midnight signoff. But at the age of 82, Bold has decided to retire, and that means WSNJ has been sold. The Bridgeton News reported Thursday that Bold will receive $20 million for the station, including its real estate and prominent self-supporting tower, from an unidentified buyer “from South Carolina.” That, in turn, immediatedly prompted speculation involving the Beasley family, which owns a Philadelphia cluster that includes WXTU (92.5) and WPTP (96.5) – though we’d be quick to note that Beasley Broadcasting is currently headquartered in south Florida. We’ll be following this one closely in the weeks to come. In CONNECTICUT, WGCH (1490 Greenwich) is trying to stay on the air in the face of an eviction notice. The little community station has known for two years that it will have to abandon its tower at 175 W. Putman Ave., a move it’s wanted to make anyway, since new construction has blocked much of the signal from that aging facility. Now it appears WGCH’s landlord has run out of patience, leading to a September 17 notice to vacate the site and remove the tower. WGCH’s latest plan for a new site, in the face of what its owner calls the “severe, almost draconian zoning regulations” in Greenwich, involve the parking lot of the Cos Cob Marina on River Road, about two miles from the present site. WGCH has asked the FCC to move quickly on approving the use of a very short Valcom fiberglass whip antenna, a type only approved until now for daytimers (the first one being WSHP 1480 in Shippensburg, Pennsylvania). We’ll keep you posted on WGCH’s status as the eviction notice works its way through the system; we believe the station remains on the air for now. The Fox that Growled: NERW was quite surprised during its trip up to Bangor, Maine a week and a half ago, when a quick check of classic rock WWFX (104.7 Belfast-Bangor ME) turned up country music instead. It seems the “Fox” has undergone a species-change operation, emerging on September 20th as “the Bear,” playing “hot new country.” This sets up not a cross-town rivalry, but an across-the-street rivalry with longtime Bangor country leader WQCB (106.5 Brewer-Bangor ME). Q106’s studios are just half a block down Acme Road from WWFX in Brewer, Maine. The nice folks at WWFX weren’t saying, but NERW suspects a call change is in the offing there. NERW editorial comment: The move to country is probably a sound one. WQCB has been without competition since 97.1 Bangor changed from country WYOU to modern-rock WWBX (“97X”) a year or so ago. And between 97X and rocker WKIT, the rock wars were getting a bit heated in Eastern Maine. Up in Vermont, WCMD (89.9) in Barre is now on the air, simulcasting religious WCMK (91.7) in Bolton. The 90.5 construction permit in St. Johnsbury, granted as WAQA, has filed to change to WCKJ. This will reportedly be another religious outlet. Not too far away, in Keene NH, WKNE AM/FM (1290/103.7) have reportedly been sold for a total of $6 million…more on this next issue. I’m told by Leif Erickson, via Facebook, that Mikey Adams’ arrival on WFNK will shift Leif’s show to 6pm-12mid, but he *will* still be working there. And he’s still doing all his other duties around the station as well.